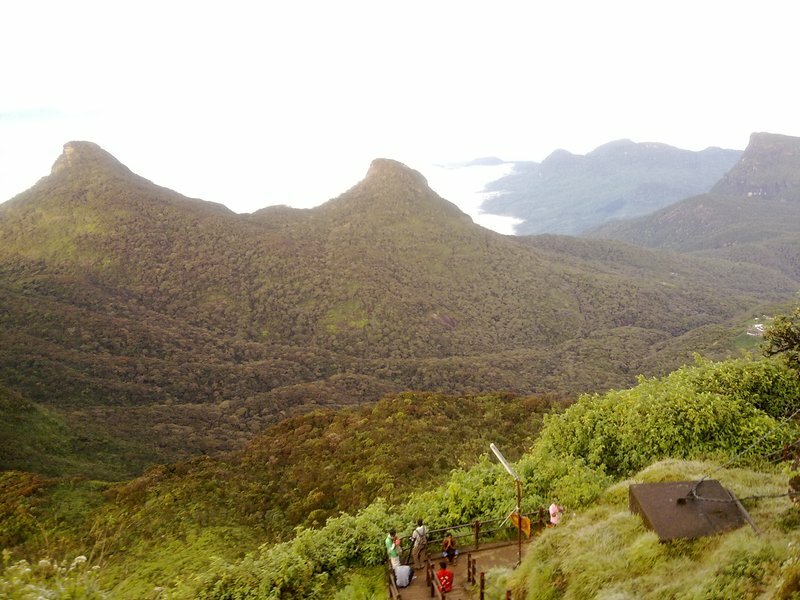 Hiking Adam's peak from both sides in one day! 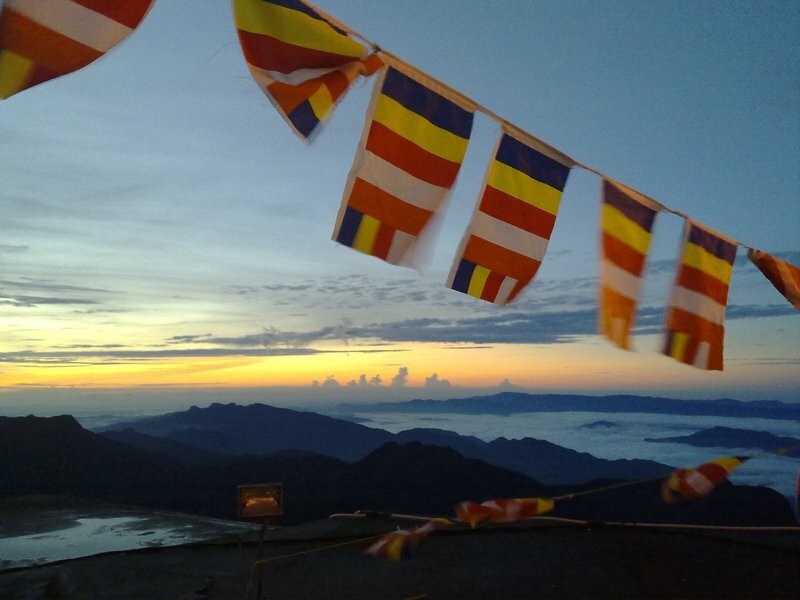 A pretty ordinary actually... To hike Adam's peak - Sri Lanka's holy mountain from Dalhousie. 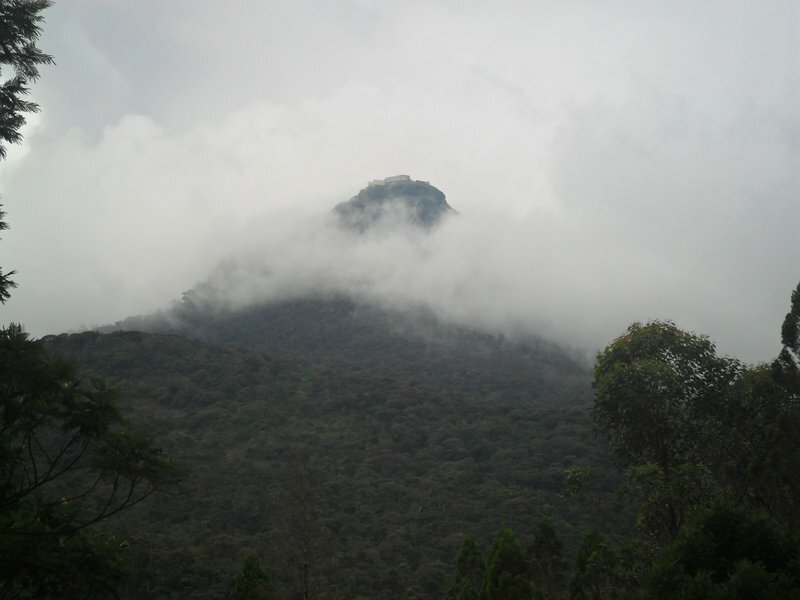 Adams's peak is the most holy place in Sri Lanka and a major point for both tourist and religious pilgrimage. From Dalhousie it's only 5000 stairs... easy right? Practicalities - it's easy enough to get to Dalhousie - the most common starting point. I took a bus from Kandi to Hatton where at the bus stop everyone knows where you supposed to be going and will put you on the right bus only a couple of hours away. Dalhousie is no more than a base camp. It has a bunch of guest houses, market, bus stand and a monastery. Fairly easy I found a guest house for 800 rupee. The plan is to be on the top for sun rise which in March is at about 5:30 am. I decided to do an "under 2 hours challenge", there isn't really a challenge, but it wouldn't be fun if I haven't made one up for myself. So there it was. I left the hotel at 2 am and rushed down path. It's a beautiful feeling when you leap step over step as if you were flying up the hill, but it only lats about 5 minutes.... Than it gets hard... really hard, you have to work out a comfortable pace and make frequent stand up breaks and at least one sit down. Having said that, there were some 80+ grandmas who were hiking up like terminators- unstoppable! If you don't challenge yourself (spelled - make your life difficult) it can be quite an enjoyable walk, there are tea stalls and shops all the way through. Well, I did it in just 1 hour and 50 minutes! 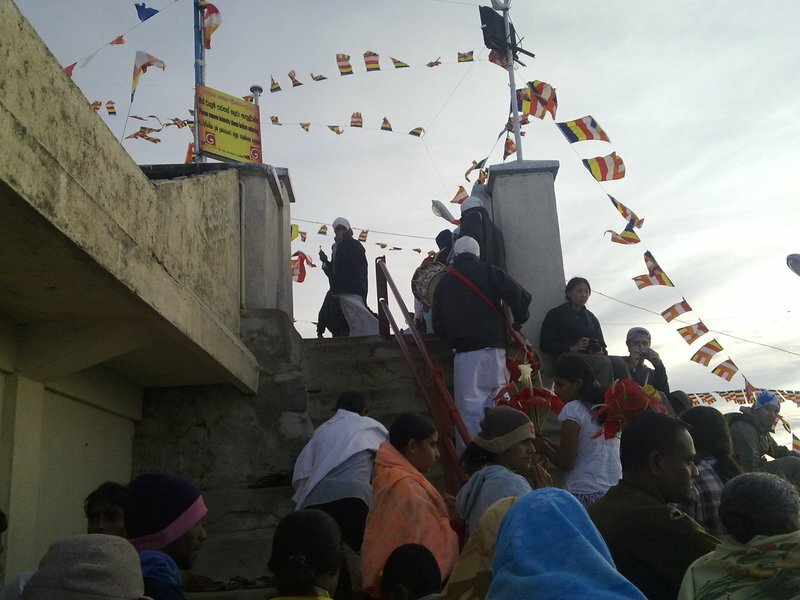 I was about to go down, but than I saw a staircase leading in the opposite direction and a sign saying "Ratnapura". 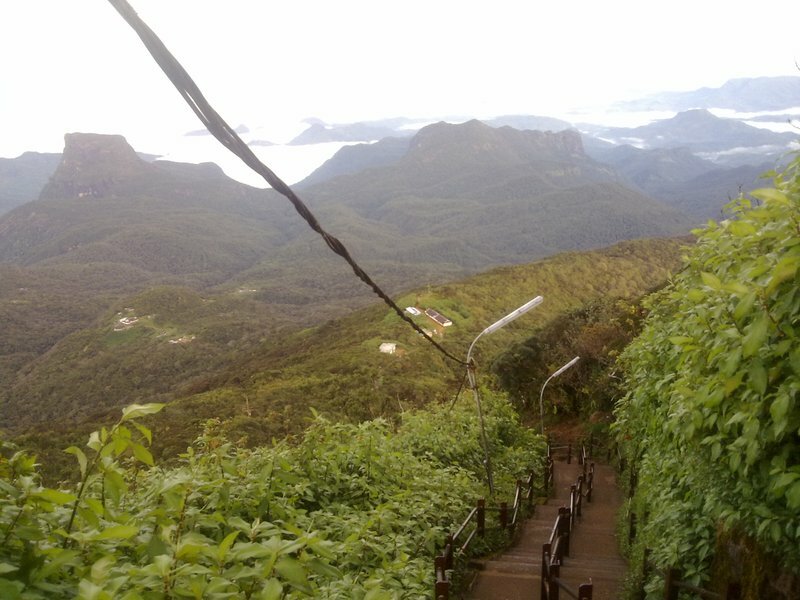 It'd be silly to go up and down Adam's peak the same way, wouldn't it? Especially because this is exactly what everyone else does. It took me about 15 seconds to make up my mind and decide on the following plan. I'll go down the Ratnpura route, which I knew was longer, but it's downwards, hence no biggy. Than I'll take a bus and get back to Dalhousie. I was down by about 10 am, took me not more than 4 hours. Was quite a pleasant walk and a drastic contrast to overcrowded Dalhousie route. The idea is is that the harder it is to get to the top the more karma-points you get, hence the only guys who do it the long way are monks, well and me, but I'was going down so it doesn't really count. 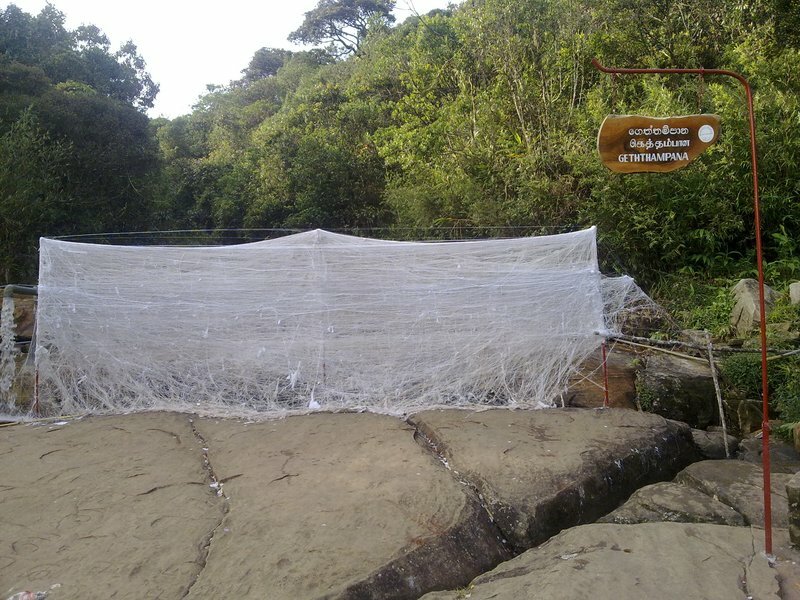 There is a bus stop at the bottom of the trail-head and a shop with a few very curious locals. 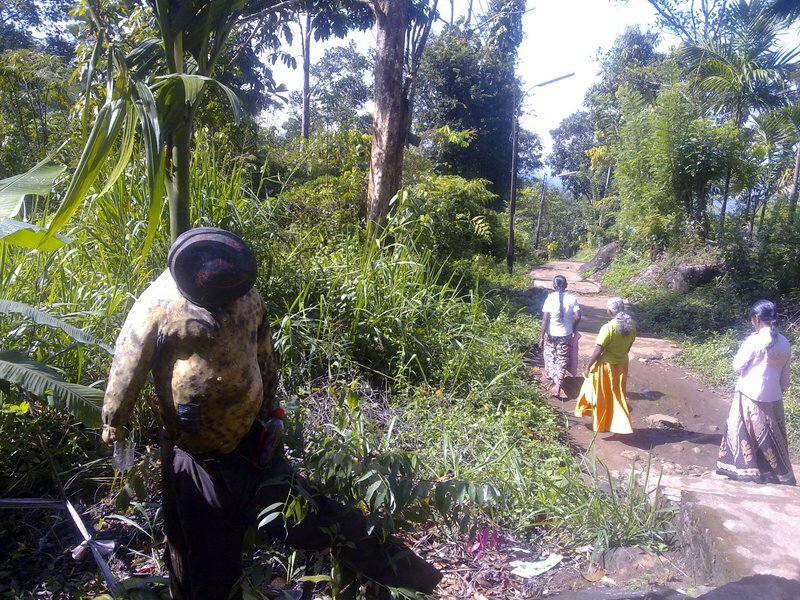 Wasn't long before I got on a 1,5 hour bus to Ratnapura town from where I was going to get an easy connection to Dalhousie. I got of the bus just to realize there was no bus stop toward Dalhousie, which wasn't a problem. It's often the case the destination name isn't written in English or you simply have to change buses, been there done that, all fine. I tried to ask around, and that's is when I realize that I'm well of the beaten track. No one speaks English, literally no one. Oh yeh - that was 2010 and I had dumb Nokia so no GPS or Map, and I didn't take a Lonely Planet with me, since it was a simple up and down jog. I try Dalhousie, Dauhooise, Dal-house, Dalhooisee, until I remember the little of Hindi that I learn on the road Sri Pada (Holy Mountain) - BINGO. The guys put me straight on the right bus, and I switched off almost instantly. I got of the bus rubbing my eyes and being ready for a nice Lankan curry... just to realize that I was exactly at the place where a bus picked me up some 5 hours ago. After conducting in-depth assessment of my options I rationally decided to toss a coin. The coin said - "you are walking up mother f**er", you can't argue with a coin can you? This pic is taken on the way down, on the way up I have run out of battery. 1- count your steps - makes muscular pain easier to take. 2-break you step. do 20 lefts and 20 rights, otherwise your right (if you are a righty) knee takes all the damage, and you fall. I know, I fell and couldn't get up for 15 minutes or so. 3-don't eat, stress and overexertion can give you stomach ache. You can walk on hungry with a bad stomach it's much harder. 5-have 2 cycles. A short one - 5 min stand up break every 15 minutes, a long one - 5 minutes - sit down break every 4 short cycles. If you master all of the above you turn into a robot and there is nothing that can stop you from having curry for dinner! As you get closer to the top a hand rail starts... This was a beautiful site, I knew I was close! I grabbed it and pulled myself up, I haven't even realised how much strength I had left in my hands... It was so much easier than walking, just pulling myself up the rail. Why did I bother to walk at the first place? By 10 pm, I was on the top. I dropped on my knees and praised Lord Budha for about 15 seconds. After that I was flying down the stairs like an antilop. It took me lest than an hour to reach my place, and surprise everyone big time. My host told me she was about to warn police as she realized I wasn't back, as everyone gets back by 8 am latest. Cooked me some of that carry I craved for and sent me of to bed. 15,000 - steps up and 15,000 steps down - an equivalent of 750 floor building. 24 - kilometers walked - just... felt hell of a longer! 1 - knee - well messed up. If you liked or hated this post please leave a comment!